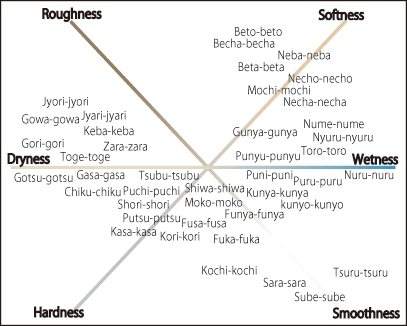 Humans perceive such material properties of objects as roughness, hardness, and temperature by touch and judge them as comfortable or and uncomfortable. 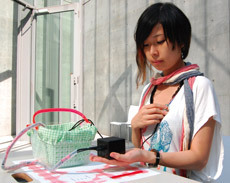 Then the tactile sensation is expressed and transmitted to others by language. The goal of our research is to understand the mechanisms of tactile information processing from multi-level viewpoints, namely, from how the physical stimuli are sensed by tactile receptors, to how neural signals are encoded, how emotional judgments are made, and how the sensations are expressed verbally. Through our research results, we hope to develop new tactile information presentation technologies and practical applications for deeper communication experience. In recent years, tactile information presentation has been adopted in mobile terminals and gaming devices. Understanding how humans process tactile information is important in the development of tactile information presentation technologies. In addition, since tactile sensation is deeply related to feelings of comfort, attachment, and emotion, tactile sensation can be used, not only to present information but also to achieve richer communication that connects people. In the same way that eyes have different cells for encoding colors (red, green, and blue), our skin has various sensors to detect vibrations, temperature, and other information. We are using psychological methods to study how these neural signals are processed in the human brain. Illusions are phenomena, in which there is a discrepancy between what our brain perceives and what actually exists. They provide important clues to shed light on how neural processing of tactile information. In addition, illusions have dramatically improved the capabilities of information presentation devices. We are conducting research on tactile illusions such as the tactile continuity illusion (see right (1)) and thermal referral illusion (see right (2)). Tactile sensations are deeply related to preference, comfort, and other sensory judgments. We are also conducting research to elucidate the relationship of tactile sensation and emotion. 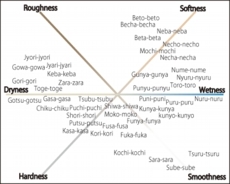 Analyzing words is a means to psychologically study the categories of sensation. We are focusing on onomatopoeia (general term for mimetic words) and created a two-dimensional distribution map of onomatopoeias based on their impressions. The map enabled us to visualize the relationships of categories in touch.